It is important to make sure to periodically clean your gutters with the approach of fall weather. With leaves falling off the trees and strong winds associated with hurricane season, gutters can often become clogged with leaves and debris. Clogged gutters can lead to water damage in the attic, home and basement. Clogged gutters can also lead to ice dams during the winter months. Ice dams can cause water damage in the attic and cause the gutters to pull away from the home. To clean gutters you need a ladder, garden hose, and a pair of work gloves. Make sure when using a ladder that it is set properly on the ground to prevent accidental falls. Clean gutters by initially removing leaf and branch debris with your hands. Then use a garden hose to force residual debris and water down the length of the gutter and out the down spouts. Also while cleaning the gutters, inspect for and repair any damaged gutter pieces. Also make sure the fascia trim boards adjacent to the gutters are not showing any sign of rot. You may also want to scrub the exposed fascia board to remove any mold or mildew that may have formed on them. This week’s news reports about plunging existing and new home sales should not come as a big surprise. The unemployment rate still officially stands at 9.5% and the administration says it could get worse before it gets better. We are already seeing signs that their prediction is coming to fruition. Honestly, who’s going to buy a home when they are either unemployed or worried about becoming unemployed? To some it may appear incomprehensible that with recent rising profits businesses would not be hiring. However, if you put yourself in the shoes of either a large or small business owner you might be doing the same – preparing for a business profit ice-age. With U.S. federal corporate tax rates at 35% they are already nearly twice as high as the international average. Then foist upon them major health care legislation costs and huge increases in tax rates as of January, 2010 and you can’t help but understand their hesitancy in hiring. Capital gains and interest and dividend tax rates, for example, are set to jump from 15% to 39.6% in January. That’s a 165% increase!! Those types of tax increases on business and investors generate a giant sucking sound in profits and market caps. Reduced profitability and lower market capitalizations hurt businesses ability to retain employees let alone hire them. So no one should be surprised with the latest dismal home sales reports, and quite frankly no one should be surprised to see this trend continue. Until there is a change in direction on federal corporate and personal tax policy, and until there is clarity on health care cost impacts, large and small business alike will continue to be slow in hiring if they hire at all. Simply calling for the federal government to print more fiat money for more make-work “state” jobs won’t cut it. No truly objective observer really believes the trillions that have already been spent in the past couple of years on banks, unions, and poorly run state bailout programs has done anything appreciably positive for the United States. Based on the falling value of the US dollar and U.S. Stock Exchanges, it’s obvious the world doesn’t believe the spending has worked, so why should we. To conclude, if the administration and congress continue on their current reckless spending, power grab, and corporate regulation course, future United States homebuyers may soon be doing what other citizens have done in other federally run government centralized countries, standing in line for state owned housing and awaiting government issued food and furnishing handouts. So much for the American dream. If change is not imminent, get ready to put a fork in it as we are done as our forefathers new us. I had a chance to spend the weekend up in Canada this weekend. 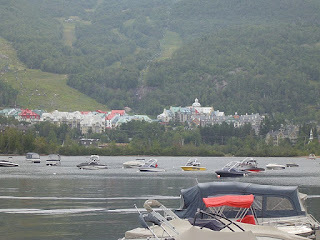 I based myself in Montreal, but spent much of Saturday up at Mont Tremblant Ski Resort area checking out homes and the scenery. What a beautiful place. It was like being in the European Alps. I also had a chance to spend two evenings in old Montreal and see the Notre Dame Cathederal and other tourist attractions. Suffice it to say, what a beautiful city and great people. I was shocked when a Metro worker came out from behind his glass window information office to spend 10 minutes talking with us. He gave us detailed directions and made recommendations on what to see in Montreal. 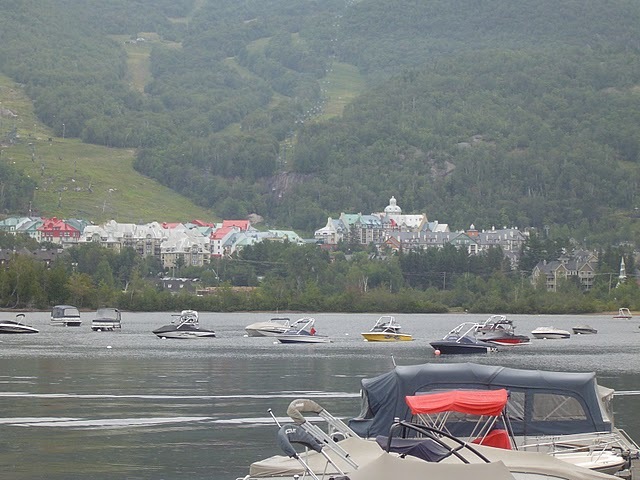 Above is a picture looking over at the ski resort of Mont Tremlant in Quebec, Canada. Last month Harvard’s “Remodeling Futures Program at the Joint center for Housing Studies” reported that home remodeling spending is expected to accelerate in early 2011. This is based on its “Leading Indicator of Remodeling Activity”, also known as LIRA. However the report is quick to state “absent a reversal of recent economic progress”. I’m not so sure that there has been any real economic progress, at least at the homeowner and consumer level. Certainly corporations showed some positive quarterly reports earlier this year, but the ability for them to sustain those positive earnings are now coming into question. But in terms of unemployment, at 9.5% officially and 20% unofficially, homeowners and consumers have yet to see any economic bullish times. Reviewing the LIRA historical data table linked in the report (Home Remodeling Spending Report) it is astounding to see that homeowner improvement spending has declined from 3Q2007 through 1Q2010 in every quarter, and is expected to continue to fall until 4Q2010. Based on new economic data since this July report, it may be even longer before there is finally an uptick in homeowner improvement spending. The data further suggests that homeowner improvement spending peaked at $146.2B in 2Q2007, and is expected to fall to $107.7B by 3Q2010. That represents a 36% decline in homeowner improvement spending. This fact is both shocking and not surprising. Not surprising that homeowner spending dropped, but shocking by how much. The home has been historically the quintessential American dream. Based on a combination of economic conditions and possibly a new view of owning a home, it appears that the home is no longer a special commodity in the hearts of Americans. When managing a major home remodeling project, trying to keep track of multiple contractor material lists can be nearly impossible. In addition, trying to use multiple paper copy cost breakdown lists to manage overal home remodeling project costs is impossible. By organizing all of the material and labor costs in one home construction Excel spreadsheet file you can more easily manage your home remodeling costs. 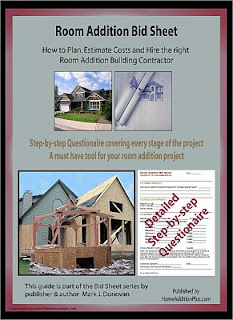 Check out my home remodeling bid sheets and their associated material / labor Excel spreadsheet forms to learn how you can more accuratlely manage your home remodeling construction costs. 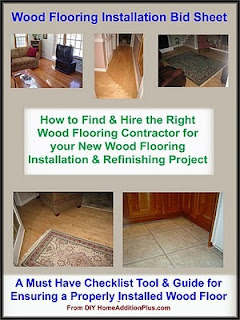 I just released my lastest new bid sheet / checklist, the "Wood Flooring Installation Bid Sheet". The Wood flooring installation Bid Sheet provides a 100 question "Request for Quote" section for soliciting wood flooring installation contractor bids. It also includes information on wood flooring material and labor costs and time intervals for completing work. Lastly, it includes a homeowners section on how to interpret hardwood floor installation contractor responses to the "Request for Quote" section, so that the right wood flooring installation professional is hired. Learn how to find the real wood flooring installation professionals who know all the trade secrets in achieving a beautiful wood floor installation and finish that will hold up for decades to come. Steer clear of an expensive learning lesson and disappointment. Order my Wood Flooring Installation Checklist / Bid Sheet today and learn how to avoid wood flooring installation disasters.